Cirrhilabrus, the “Fairy Wrasses”, are one of the most elegant, active, and colorful reef fish. Their appeal in a reef tank is common to many, but not all have a well-rounded understanding of the capability amongst them. Enter the notion of “complexes”: groupings of very closely related species within a genus. 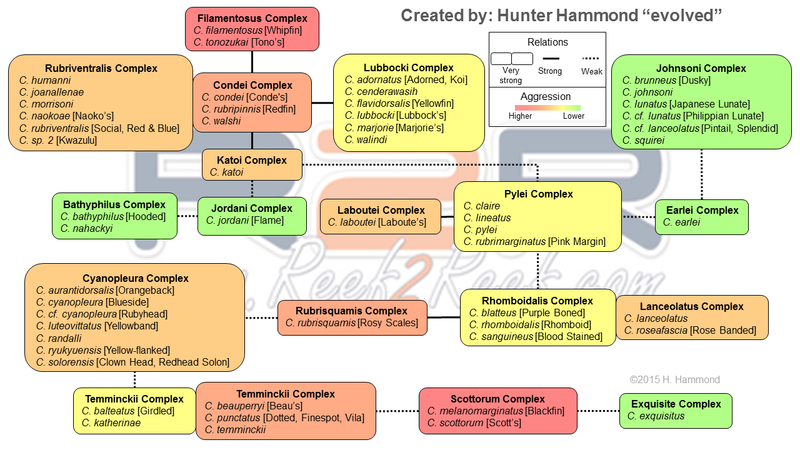 Complexes create groups in which the species have a physically similar structure; the body shape, fin shapes/sizes, and maximum length create these groupings. Coloration is not necessarily a commonality within a group (but patterns are, to a moderate degree). From a genetic viewpoint, it is quite likely each complex originated from a common ancestor or perhaps from one species still within the complex. Scientifically, complexes do not really exist. They are a notion created amongst hobbyists to aid in selecting more compatible species. Complexes have large implications on levels of aggression and compatibility amongst other complexes. For the most part, the level of aggression within a complex is similar for all those species it contains (of course, there are always exceptions). The chart below presents complexes within the Cirrhilabrus genus. As mentioned, these groupings are not exactly scientific, and some placements could be debated. The intent of the chart is to be functional rather than purely scientific. The number of complexes is unimportant. Rather, what is important is the relationships amongst the various Cirrhilabrus species for the hobbyist seeking to make these beauties a part of their reefs. The complexes are named simply by one of the popular or common species from each complex. The relationships between the complexes are represented in one of three ways: by adjacent boxes (very strong), by solid lines (strong), and lastly by dotted lines (weak). Also, the shading of the box represents the general level of aggression of the complex relative to the others. Red boxes have the highest levels of aggression, while green have the lowest. When seeking to mix two or more species within the same tank, the chart should be used in the following manner. The further away two complexes are the more likely the odds of compatibility will be. Additionally, the odds of success also improve for similar levels of relative aggression between two complexes. The extension of these two statements can be applied to mixing various species within a complex as well; the higher the aggression levels the less likely this will be successful. Those complexes of the lower aggression levels can generally be mixed amongst themselves with relative ease. [One caveat here: those two complexes in red (Filamentosus and Scottorum) should not be mixed with any other complexes or amongst themselves unless the system is extremely large, say over 400 gallons.] For example, mixing an Exquisite, Lineatus, and Hooded is rather safe. However, mixing a Conde, Rubriventralis, and Adorned would be problematic at best. With a bit of luck and knowledge, this chart can prevent needless frustration and incompatible additions the next you find yourself in your local fish store searching for your next, or first, Wrasse addition. Happy Reefing! For more information on all other types of fish check out our fish discussion forum here. Hunter Hammond is a marine hobbyist who currently keeps a 190g reef in his living room featuring numerous rare wrasses. He is a leading expert in the captive care of all reef-safe wrasses. He has been in the marine hobby since 2009 and lives in Phoenix, Arizona with his devoted partner and their Thai Ridgeback dog. Hunter’s professional career is in the aerospace propulsion engine industry as a structures engineer.